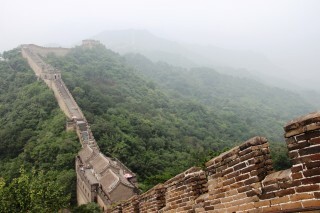 There are at least three different kinds of walls in China. They are typical for China. First of all there is the famous Great Wall. It is a territorial wall. A wall to protect against the enemies who live outside in the world. A wall to defend the own country successfully. A wall to keep the country together. And a wall to demonstrate power. Secondly there is the wall around the Forbidden City. It is an ……..architectural wall. It is the wall to demonstrate the big difference between sovereign and people. It is a wall keep them apart. It is a wall to demonstrate the power of distinction. And it is the wall to mobilise the fantasy of the Chinese People in order to control and to dominate them. Finally there is the “shenceng jiegon”, or so to say the Walled Ego (as it is described and analysed in the book of Sun Longji “Das ummauerte Ich”). This is the wall which is between the ego, the individual person and the outer world, the community, the society. On the one hand it protects the personality and functions as a shelter. By that it inhibits and impedes a personal development in society as an independent, autonomous personality, integrated in society.